I'll be honest. Birdy is giving me a run for my money lately. We've entered the Phase of Discontent. The screeching, screaming, back-arching days when nothing seems to make her happy, when she can never keep up, and when the only thing she has interest in doing are all the things she can't do. (aka she wants to do whatever her sisters are doing). It is begining to wear a bit on my nerves. A full day of a discontented baby makes for a very long day. I try to remind myself that this is a phase, that all my children went though this. 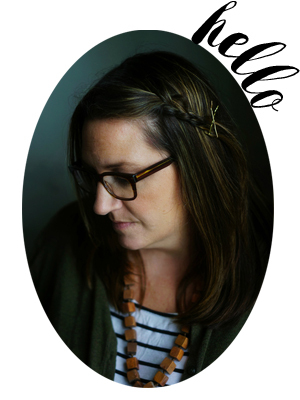 That with each of the girls there were days where I found myself standing in the doorway, tears creeping down my cheeks, waiting for my husband to arrive home from work so that I could hand over the babe and catch my breath. Yes, that was me just a few days ago. Phew. But one fool-proof way to keep Birdy happy is to take her outdoors. Now, outdoors at our house is not your typical green grass and swing sets. There are patches of mud, stones and ahem, chicken poop to dodge. Wood piles and stray splinters of logs. Gardening tools and sump pump hoses. I could make myself crazy keeping her from all these things. Trying to keep her from crawling straight through the mud. From putting the sticks in her mouth and taking off across the soaking wet tall grass of the field to go after the dog. From eating stones and tree buds scattered over the driveway. From sticking her face down in a pile of dirt and tasting it. And so, to save my sanity, I've been letting her have at it. Giving her freedom. Letting her roam and explore and taste (to a point) and touch and crawl through and over and under. Unless I'm concerned for her safety, I just let her be. I watch her pull up clumps of green grass, eat a few strands, make a strange face and spit them out. 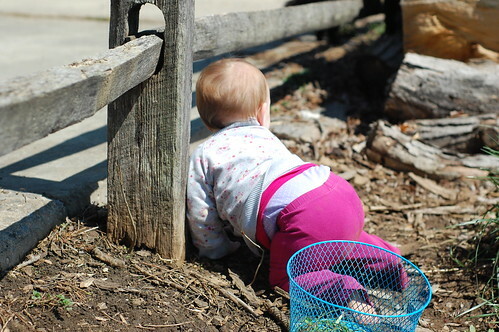 I see her spy a scurrying barn cat out of the corner of her eye, and immediately change directions to crawl after it. From my watchful perch I can see her learning and exploring, and I imagine how that little brain is expanding with all these experiences. What's the harm in a mouthful of soil? Or sucking on a stick? 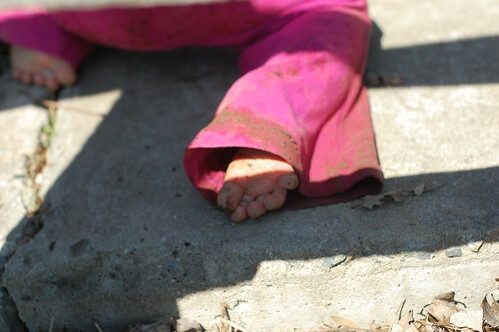 Or crawling through a mud puddle, hands and knees and toes covered in brown? It's about letting go. And freedom. And fresh air. And learning. My boy is the same age & also going through a nutty phase. Outside is better. And dirt is good. Thanks for reminding me. Oh, those darn cute babies. Even if you know it’s a phase it doesn’t make it much easier. Hoping you had a better day. My little Violet and Birdy are the same age. Also, they both have to dodge chicken poop. I totally could have written this post today. Down to the mud and poop. Outside is magic these days for my little screechy one. oh the phase of discontent. I (only slightly teary) told my hubby we are here today with the youngest in our brood (a pack of boys). The back arching? the only want to do what you can’t yet? oh yes.what a journey. You’ve given yourself some great advice: Have at it, Birdy! And I agree with Heather: as long as she doesn’t choke on it, that soil is building her immunity. And tears are okay, yours and hers. no matter the age – outside is best – it’s true for all my kids no matter the age!! good thing summer is on it’s way!@! Thanks. Although my youngest is two we have hit a new stage of independence. And Mommy needs to let go and let God. Also part of me wonders is today/yesterday is making all of the stir crazy come out of our children or if we moms just need to share with others how we all face this from time to time (or a lot of times). Beautiful photos! Thank you. Oh yes! I am going through this same thing with my third child–he wants to be doing everything his siblings are doing. There is a whole bunch of back arching going on over here too–Ugh! Outside makes hiim better too. This afternoon when he came inside, he looked completely brown! I think you hit the nail on the head Molly! Hang in there! This too shall pass! A very timely post. 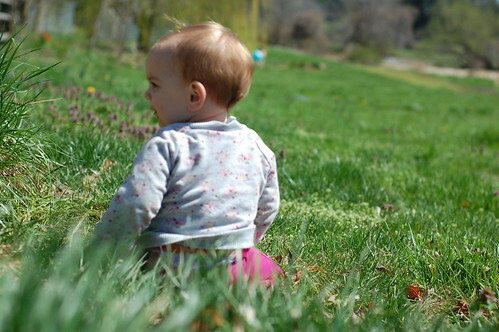 I have a 4 year old and a 10 month old and I’ve been wondering how to handle being outside this spring. The little one loves to crawl around, but I’ve been nervous about letting her get into to too much. Meanwhile, it’s not fun to run around with the older one with a baby permanently attached to my hip. You’ve given me permission to just let her go. Thanks! Your posts about Birdie always resonate with me since my 4th daughter is almost exactly the same age. She too, is at the stage of discontent and is not happy unless she is climbing on something she shouldn’t be. She can’t walk, but boy can she climb! But outside is indeed a magical place! This is just the reminder I need. My own third girl is almost 9 months. And wants to only be down while outside but also wants to eat everything. It’s exhausting. good reminder. Yes. I wish I could explain this as eloquently to my babies’ grandmother, who is borderline OCD in relation to her intense fear of dirt, dust and more dirt. She just happens to be in town visiting right now and after 5 days, I’m weary of hearing her panic everytime my crawler gets within inches of our pets or sticks his hands in his mouth after crawling around on our (mostly clean but very old) hardwood floors. I am right there with you! I have 5 kids and my youngest is 20 months old…I have let go and let him run around our yard in all kinds of chicken poop, dirt and whatever. He gets a good wipe-down before lunch…those battles just aren’t worth fighting right now and if he is inside he is just into everything and fussy!! Those days with unhappy babies can be just soooooo trying on the nerves. Hugs to you! And I love the free range baby. It is so hard when those younger ones watch the bigs. I remember just watching the little one crawl after the big two and just praying that she’d be okay. I’d think about the babes in the caveman day and feeling like they survived eating rocks and not to worry too much. this is just what i needed to read today! i’ve been having some of those days (ok, a lot of them) lately. I’m glad to hear that discontent is a phase, and maybe a sign that I’m smothering him a smidge. Bless you Molly, for bringing sanity back. Oh, you made me feel so much better! 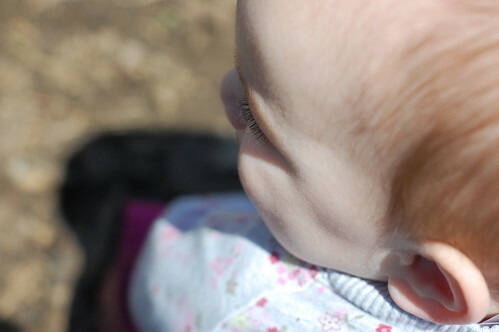 My little explorer tastes tanbark, sticks, leaves, grass rocks and who knows what else and I just let her do it. Neither of us have fun when I try to keep her from exploring and staying inside is not how we’re going to spend our summer, so….In her mouth the world goes. I just don’t think too much about it! We are going through this phase too! So glad to know I’m not alone in this. 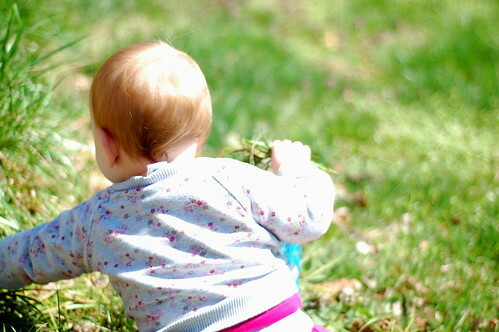 I’m so thankful to live in a place where she CAN crawl around outside. No idea what we would have done if we’d stayed in the city. I just have to tell me self every time she sticks something in her mouth “it’s cleaner than anything in china” (where we used to live) and then just let it go. Thanks so much for the encouragement through your honesty. Have you seen the documentary, “Babies?” It follows 4 babies from around the world. Some of the things the mothers in other countries allowed their babies to do made my heart stop, but they are all OK, thriving and doing well. Glad you are letting go. I need to take that advice sometimes! plus, when you let her get messy… she gets to get clean and smell amazing. baby baths are calming for both of you. And like other people said, it builds immunities! Ohhhh Mama-friend. How well I remember those days…The days of standing there sobbing thinking, “I just have to hold tight until The Viking comes home and then he can be the one to deal with this monster and I can pause and breathe and just breathe”. 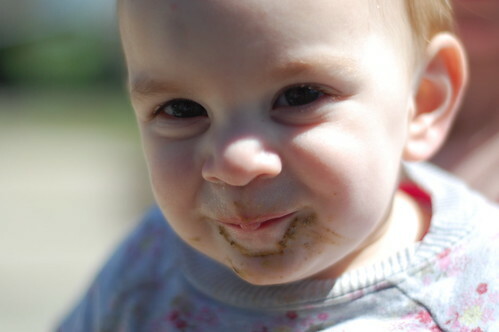 My sweet Stomp also loved being outdoors and I would fret and worry…until one day he ate a fistful of potting soil. When no immediate harm came and the Biddies didn’t come to take him away from me for neglect, I mellowed out a lot 🙂 It helps. And to think, I’m fixing to bring another monster into this world to go through it all again! Baby care:What a cute little adorable post,Happy to c u have a Pretty Lovely baby..You are really very lucky to have a sweet!!! Oh yes! This is a great post on all levels–truth about mommy emotions and truth about letting go and when you do, it can benefit mommy and child. Thank you, thank you, yes! How much motherhood change us and teach us.It’s always so nice to hear-read about other moms going for the same.